I have the worst willpower ever. This is a lady who cannot say no to a second/third/fourth piece of cheese, a fine piece of stationery or any fabric sale. So now that the weather has turned cold down here and I’m pulling out my autumnal snugglies it was time to fold like a cheap suitcase and make another secret PJ dress. All hail the power of the stealth pyjama! This comfy sucker is exactly the same frankenpattern hack as before – the Colette Moneta top with the Blue Ginger Doll Violet skirt. The only change I made to the merging of the two patterns was to omit the pockets and smooth the side seams to match better before cutting. Lesson definitely learnt from last time. The fabric is what got this whole sewing party going – and managed to kick-start my poor withered sewjo. I found this sassy number at Addicted to Fabric in the morning, took it to CBR Sewing Crew in the afternoon and cut and sewed everything up in less than three hours. Winning! 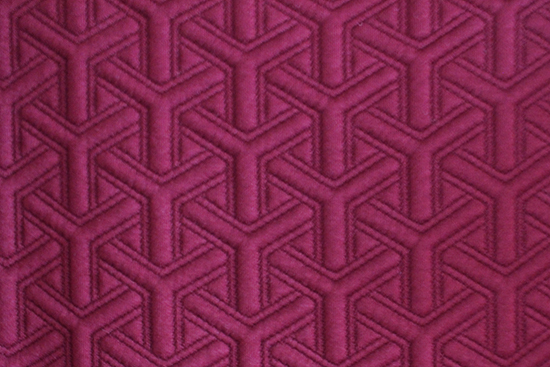 The fabric is yet another weird poly faux quilt number but in the most delicious shade of burgundy/merlot/tasty red wine. The poly wadding between the two layers was falling out very easily so I made sure all edges were sealed with my overlocker before really kicking off. The construction was super quick which makes for an easy win. As this was a total impulse sew I forgot to try and tinker with the front armhole as noted from my last Violet/Moneta hack. Doh! In the end it is fine but that fabric fold is telling me there needs to be a bit more room to move in there. Facings were left out again and the neckline was folded down and topstitched. And hang on to your smelling salts, delicate readers, for I went scandalously rogue and used a long straight stitch, rather then a zig zag, for my topstitching on the sleeve ends, hem and neckline. Boom! This sewist cannot be tamed! The speed of construction. Such a quick turn around from go to whoa was just what Dr Sewjo ordered. 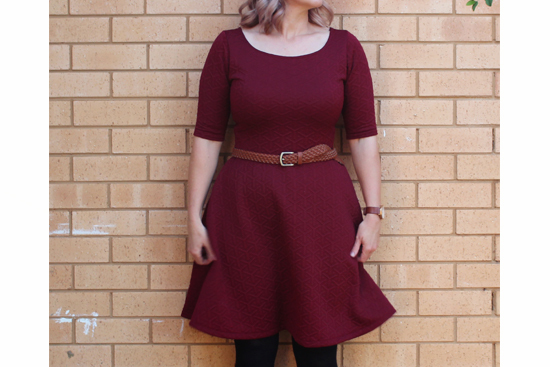 Thank you autumnal wonder frock™. The fitted design lines. I have been wearing garments with lots of ease lately and they just don’t work for me. It’s not me it’s you, ridiculously gorgeous but blousy Japanese sewing designs. The colour. This is the only red thing in my cupboard (apart from my 14-year old Hogwarts hoodie) and I’m trying to work out why there isn’t more?! Scoop the neck a little. I shall be risqué with a little more skin on show! Nothing else! It’s a winner. Overall, I love my new secret PJ dress. It’s on heavy rotation in my work wardrobe and I haven’t yet succumbed to napping under my desk in comfort – double win! In other news, El Husbando and I fly out next weekend for our five week adventure through Peru. Eep! So much to do and so little time left – I best get to it! 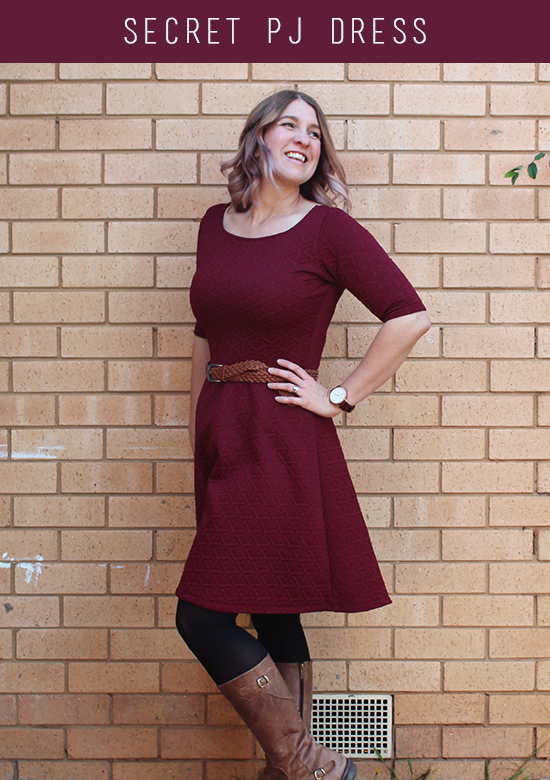 Gorgeous color, gorgeous pattern hack, gorgeous dress! Glad your sewjo is back! Yes you need more of this color in your life! The fuller skirt looks great with the bodice. Enjoy Peru! Thanks, Morgan! I am obsessed with this burgundy and haven’t been successful finding more. I wonder if I can dye my own?! Agree with Morgan! This colour looks amazing on you! I bet, this dress is super comfy, and I won’t be surprised, if you made at least one more. Have fun in Peru! Thanks, Inna! I almost bought some more quilted fabric in Peru but my backpack was squished full. Boo!!! Not going to lie- am super stoked with this frock! Thanks, Caz! The fabric is so cool! Thanks, Sarah! And also – Team Straight Stitch for the win! Thanks, lovely! The fabric is crazy awesome! 5 weeks in Peru!! Sounds wonderful! Cute dress! I’m really digging the fabric. It was awes,e Shanni! It went by too fast! That colour is beautiful on you! Love this dress and the textured knit! Thanks, Heather! The fabric is so cool! I was immediately drawn to the textured knit. Works wonderfully on the simple dress design. That fabric is fascinating. A stretchy knit AND with a cool embossed geo pattern?!?! Now, I could say that I intensely dislike you for joining the club of people who sew together a whole dress in the short of a few hours… but you’re far too fabulous and sassy to be dislikable. Lucky you 😉 LOVE the make! Thanks, Mel! This fabric is crazy awesome and my only regret is I didn’t get more! Noo!